My 2011 high school football team. When I was offered an executive position late in 2004, among the conditions was that I gave up coaching the school’s football teams. To accept or to decline kept me up nights; but in the end, I decided I would be naïve to decline the opportunity. So for the next two years, I went to the football field twice or thrice a week to keep fit. I interfered neither with the training nor coaching and only gave advice if it was solicited. Otherwise, I took my hands off to be respectful to the two coaches who came in after me, incidentally former players of mine as well. More than two years later and with two coaches already having left, I was asked back in; but in an unofficial capacity. Another of my former players was named coach and he took all the pay. I took care of training and coaching. This was fine. The pay was small change compared to what I was making from my job upstairs; and the football was a great way to detox each day after all the stresses being in management brought with it. Unfortunately, the preceding two years destabilised the high school team because of the frequent changes in coaching personnel. That the quality of football had declined was evident in a first-ever loss to our neighbours from across the railroad tracks in the Division Meet in 2007. This 2007 loss to the neighbours I found so annoying. We did not lose in Lipa, period! But I was an experienced coach. I knew that building a competitive football team was never achieved at the snap of one’s fingers. I figured that I needed a year and a half to get back what I felt was rightfully ours. That we would, I had no doubt whatsoever. Even that early, I had several freshmen whom I felt could really become the fulcrum of a powerful team. 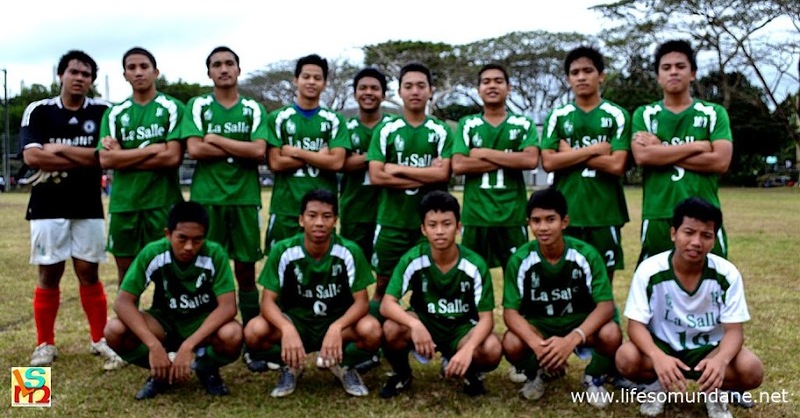 There were the prodigious talents Luis Canlas and Alex Hernandez, who although freshmen had enough skills and composure to be given starting places in the senior team. There was Renz Dimaano, a tad lazy and not just a tad overweight; but even at his age already was even more prodigious and had a great touch of the ball. Lorenzo Gherardelli, our diminutive Fil-Italian, could run all day and would chase the most hopeless of cases. The prodigious Luis Canlas (left) and Renz Dimaano, both HS freshmen in 2007. In the coming months, more players started to arrive. There was Ted Villanueva, who used to be a goalkeeper with the elementary teams. A bit surly in temperament, perhaps, and had a frown almost perpetually etched on his face; but was as natural as a defender could ever be and would become among the most accomplished to ever play for me. There was also Jairus Latayan, whose eyesight was so bad he had to play with his glasses on. Then, there was the lanky Fil-American CJ Lina, who provided the novelty of being able to speak English with a Los Angeles accent but whose Tagalog was as hopelessly Batangueño as everyone else’s. Of the new arrivals, perhaps the most promising was the fleet-footed Ezekiel Terrones. He was a coach’s dream – a player who chased lost causes as much as Gherardelli did, had a positive disposition, worked hard in training and displayed a great willingness to learn. These kids were playing day in and day out not only with the senior high school players but also with the more skilful and vastly more experienced college players. But a year after our first-ever loss to the neighbours, I knew that the team was still very much a work in progress. Expectedly, we lost the Division title again; and by a heavier scoreline than the previous year. But theirs was a team mostly of seniors; while ours was made up mostly of unproven sophomores who should, if we had a choice, been playing in a younger age group. Yet, we were outplaying them in stretches and our football was more attractive. We lost because the boys were just way too young and did not have the physicality necessary to overcome the opponents. Despite the 0-5 scoreline, I was already confident that there was no way they could beat us in the next two years. Latayan emigrated to the States and Lina would drop out. But other young boys were also joining up to bolster the team: sophomores Carlos Mindanao, Renz Bayangos, Gillian Albano and Francis Dy were among those who would later comprise the core of the team along with two really small freshmen named Tyron Regalado and Simon Javate. Of the new arrivals, the most significant was the tall Nestor Natanauan Jr., more athletic than others because he was previously into martial arts. Even then, he was long-legged and reminded me a lot of the former Liverpool defender Phil Thompson. It did not take me long to realise that I finally had the perfect partner for Villanueva in central defence. The pieces of the puzzle were starting to fall into place. I have always followed Bill Shankly’s formula of building along the spine. In Villanueva and Natanauan, I would soon have a powerful central defensive partnership. In central midfield, I had Canlas and Dimaano. Out wide, I had Hernandez and Terrones, who would both become excellent crossers of the ball. The problem was, upfront, I only had Gherardelli. I needed to find the point of the arrow, the striker who could play with his back to the goal or who could play inside the box or feed on the crosses from the wings. In June or July of 2009, JV Medina returned to football. He used to play in the elementary team but went into exile after a fracture. When he joined my team, I quickly saw that the last piece of the jigsaw had fallen into place. He was not only a natural target man but also an instinctive goal-poacher, capable of scoring with either foot or with his head. The team’s coming of age happened one weekend in September. The uniforms for both the high school and college teams had just arrived. It was the perfect day for the customary pre-season match between the two teams. The team's coming of age was a High School v College game in 2009. The high school boys had never previously beaten the college team. That afternoon, however, the youngsters chased and harried their older opponents into making mistakes and attacked incisively with instinctive touch passing. By afternoon’s end, the youngsters were celebrating their first ever victory over the college team. In the RIFA, we were playing in the league’s second tier and won our matches week in and week out. We were also doing well in the NCAA-South, where we would eventually finish runners-up after a penalty shootout loss following a 2-all draw. But there was also the little matter of the Division Meet. Because we had been in the RIFA since 1988, before the 2007 debacle we were quite blasé about this annual competition involving local city teams. Often the games were just too easy that it was not uncommon for us to continue training after playing these matches. Nestor Natanauan Jr. (right) formed a formidable central defensive partnership with Ted Villanueva. 2007 changed all that; and school pride was at stake. I capped my instructions with, “No mercy!” We beat the neighbours, 7-nil, to reclaim local bragging rights. The team was still far from the finished product, however, because all my teams peaked when majority of the players were in their senior year. All but one of my starting team were still juniors. Thus, I knew that the neighbours would be getting a really bad beating the following year. When the next school year opened, I had a very stable team. Bayangos left but his place had already been taken by John Raphael Lapid. The latter started playing the game late but was a quick learner and was in a matter of months already even better than Bayangos. In the RIFA, we were still in the second tier but the referees complained that we should have been in the top tier. We routed opponents each week and should have been champions but for one match that was defaulted. We also won the NCAA-South, routing FAITH and San Beda College-Alabang by volleyball scores. But the bloated scores were beside the point; and were a natural consequence of the quality of football that the boys played all season long. The football was as attractive to the eye when the boys were attacking as it was mean at the back when they were defending. And as for the neighbours in the Division Meet, 13-nil. I did promise myself that they were going to be so dead three years earlier. Ezekiel Terrones celebrating a goal in the 13-nil rout of the neighbours. I would, of course, leave the school at the end of the school year, having preferred retirement to working for anyone I could not respect. Nonetheless, I was happy to leave with the knowledge that my last football team played football as brilliant and delightful as my first; and that we had, at least in our home city, no peers. Some of that brilliant team had already graduated from college last summer; but several others, having opted to take engineering courses, are graduating next week. I would like to think that the boys will continue to apply the principles learned on the football field to when they take on the new challenge of real life.